The NASA Suomi-NPP VIIRS Active Fire product suite builds on the MODIS Fire and Thermal Anomalies algorithm (MOD14/MYD14), systematically mapping global fire activity at ≤12 h intervals (~1:30am/pm local overpass times). Two VIIRS active fire products are generated independently using the available 750 m and 375 m resolution data. The 750 m fire product is a replica of the MODIS Collection 6 algorithm, which was adapted to VIIRS channels M5, M7, M11, M13, M15, M16. The product comprises active fire detection and characterization (fire radiative power [FRP]) over land and water (e.g., gas flares). The 750 m product, most importantly, provides continuity with the Earth Observing System (EOS) Moderate Resolution Imaging Spectroradiometer (MODIS) 1 km product. The alternative 375 m fire product uses the higher spatial resolution VIIRS channels I1-I5, complemented by channel M13, to detect and characterize sub-pixel active fires. It resembles the MOD14/MYD14 fire products, with the addition of specific tests and metadata to account for the unique characteristics of the VIIRS 375m bands. 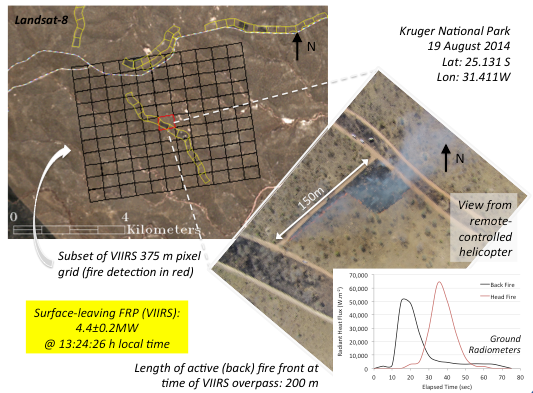 Compared to other coarser resolution (~1 km) satellite fire detection products, the VIIRS 375 m fire product provides greater response over smaller fires, as well as improved mapping of the perimeters of large fires. Consequently, the data are well-suited for use in support of fire management and near-real-time wildfire alert systems, as well as other science applications that require improved fire mapping fidelity. Both the VIIRS 750 m and 375 m Level-2 active fire algorithms are already in production at the Land SIPS, and Level-3 and 4 products are expected in the near future. The Terra/MODIS active fire validation approach using coincident/near-coincident spaceborne Landsat-class reference data (e.g., ASTER, Landsat-5) cannot be replicated with VIIRS due to its afternoon orbit, which leads to prohibitive temporal separation from those reference data. Consequently, progress towards validation stages 3-4 should be slow until alternative global reference data sets become available. In the interim, we are building on existing regional fire networks to assess the VIIRS fire algorithm performance. We are currently using intensively-sampled prescribed fires to verify the probability of fire detection, together with airborne reference data used to quantify sub-pixel FRP retrievals. We are partnering with the USDA Forest Service, exploring near-coincident wildfire data acquisitions made by the National Infra-Red Operations (NIROPs) during the peak fire season in the Western United States (May-Oct), complemented by prescribed fire data collected sporadically using the Autonomous Modular Sensor (AMS) during the off-season months.